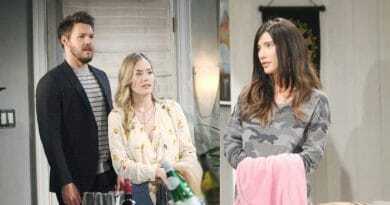 Bold and the Beautiful spoilers for the next two weeks show Shauna Fulton (Denise Richards) learns about Flo Fulton‘s (Katrina Bowden) alleged pregnancy. Flo panics as she was never pregnant, and her mother could ruin everything for her. Now, Flo works to keep her mother from spilling as Shauna has her own baby shocker to reveal on the CBS soap. To start the week, B&B spoilers shock Quinn Fuller (Rena Sofer) as Shauna Fulton reveals her past with Bill Spencer (Don Diamont). Quinn had no idea of this previous connection, and it leaves her startled. Both moms are horrified at what this might mean for their kids. Meanwhile, Quinn’s son Wyatt Spencer (Darin Brooks) is also left surprised by Flo Fulton’s actions. As previous Bold and the Beautiful spoilers confirmed, Flo plants yet another kiss on Wyatt, potentially getting lost in the moment as Wyatt helps her find her father. Bold and the Beautiful spoilers on Tuesday follow Bill Spencer throwing out some angry accusations at Shauna once Quinn stops by with her. Shauna tells Bill he is Flo Fulton’s father. He doesn’t believe this and rages at her. The same day, Quinn pressures Bill for more information. She wants to know if he could truly be Flo’s father. Obviously, Quinn is searching for the truth. Also, Hope Logan (Annika Noelle) introduces Flo to Donna Logan (Jennifer Gareis). Hope tells Flo that Donna also gave up a baby for adoption, on B&B. Spoilers say Hope’s trying to help, but this will stress Flo out more. Midweek, B&B spoilers tell us Wyatt shares a Flo Fulton secret with Bill, Quinn, and Shauna Fulton. Everyone is trying to make sense of this new information that Bill could be Flo’s father. Wyatt may be able to put things in perspective for them. Of course, he looks sick in the new Bold and the Beautiful promo when Shauna tells him her revelation. Meanwhile, Flo is uncomfortable as Hope insists on them being BFFs. 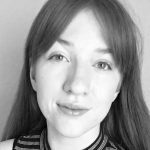 Flo likes Hope, so her guilty conscience may get the best of her if Hope continues spending time with her. Flo Fulton’s secret comes out Thursday on Bold and the Beautiful. Spoilers promise this changes the Logan, Spencer, and Forrester families forever. More than likely, this secret is about her father, which her mother Shauna Fulton says is Bill. Also that day, Flo’s guilty conscience gets the best of her and she tries to confess to Hope what she did. However, Hope doesn’t give her the chance to confess and interrupts her in the process. It seems Hope learns that she might be her sister-in-law and is thrilled. On Friday, Bill is still stressing about the Shauna baby daddy reveal indicate B&B spoilers. No matter what he does, he can’t keep his mind off of Shauna Fulton and her daughter. He can’t believe he fathered yet another child without his knowledge. Of course, Bill asked for a paternity test, so the results may say Shauna Fulton is wrong. If she’s right, it looks like there’s going to be a whole lot of drama for the Spencer family in the near future. Bold and the Beautiful spoilers promise that test and the one Flo runs should give a better picture. was supposedly pregnant. 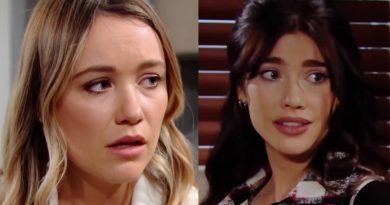 Depending on the outcome of the paternity test, these might think that Steffy Forrester (Jacqueline MacInnes Wood) is raising their granddaughter. This baby swap lie gets more tangled by the day. Quinn Fuller drops the grandbaby bomb on Bill while Shauna hears it elsewhere. Of course, Flo finding out her mom and maybe-dad think she was pregnant pushes her over the edge. Even with Steffy gone, this baby bomb may explode because Flo Fulton is at her breaking point. Watch CBS daytime to see what happens with all the baby mama and baby daddy drama the next two weeks. Make Soap Dirt your number one stop for all things Bold and the Beautiful.